President Uhuru Kenyatta makes an address at State House, Nairobi. State House recently released an extract from Executive Order Four that has kept many guessing on what else it contained. Last Thursday when the abridged order was released, two Cabinet Secretaries -- Mwangi Kiunjuri and Eugene Wamalwa -- were being questioned over a scandal that has refused to go away: the construction of the Arror and Kimwarer dams. With five CSs and several principal secretaries on the radar of detectives,who are questioning them on multi-billion-shilling scandals, there are pointers that a reshuffle could be in the offing. State House spokesperson Kanze Dena-Mararo told the Nation on Sunday that the long form of the Executive Order contains decisions informed by deliberations of the National Security Council "which are classified". "An extract of non-sensitive aspects... was settled on so as to fulfil the obligation of giving the public timely information on the actions of the Head of State," she said. Directorate of Criminal Investigations (DCI) boss George Kinoti would hardly summon a minister without the knowledge of the President. Mr Kenyatta has told ministers that they are on their own. While it is not clear when he will strike, Mr Kenyatta is hardly known for keeping CSs implicated in scandals. Unlike before when State House released full executive orders as signed by the President, it was Ms Dena-Mararo, who signed last week's "notification". 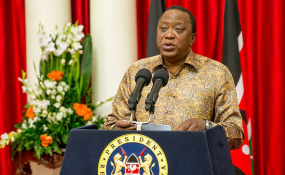 It was the first time President Kenyatta released piecemeal information on State appointments and nominations that were to take effect immediately. State House only revealed that the President had nominated Mr Hilary Mutyambai the Inspector-General of Police. He also dismissed Commissioner-General of Prisons Isaiah Osugo, who had been at the helm since 2008. The fall of Mr Osugo and his replacement with Eastern Regional Commissioner Wycliffe Ogalo, follows a Sh4.8 billion arms procurement scandal where questionable tenders were awarded to a firm belonging to a Jubilee senator. With five CSs having recorded statements with the DCI or the Ethics and Anti-Corruption Commission (EACC), focus has shifted on the President -- and on if he will make a move. Treasury CS Henry Rotich was questioned for three days after it emerged that Kenya paid a broke Italian firm Sh7 billion to build two dams in Elgeyo-Marakwet whose works are yet to begin 14 months after the payments were made. Treasury paid another Sh11.2 billion to Sace, an Italian government agency, to cover 100 per cent of the principal and interests against any potential financial risks to cushion the lenders. The DCI says the amount paid so far is Sh21 billion -- and that the fate of the two projects, plus the unfinished Itare dam in Nakuru -- will be determined by the financial health of CMC di Ravenna, the contractor that filed for bankruptcy. Mr Rotich has maintained silence on the matter -- opting to issue a statement through his lawyer, Katwa Kigen, who said the CS had nothing to do with the tendering. Some lawmakers from Elgeyo Marakwet, where Mr Rotich hails from, say he is being harassed in a bid to thwart Deputy President William Ruto's presidential bid. More so, some Orange Democratic Movement MPs have been urging the President to drop him. Agriculture CS Kiunjuri drove himself to the DCI offices after being summoned via SMS. Mr Kiunjuri said he would face "whatever is thrown my way with confidence, determination and patience... even the darkest night will surely end". "Over the past seven months, my name has been dragged through mud and appeared in newspapers and social media for all the wrong reasons -- from the maize, sugar, fertiliser and now the dams scandal." "I have been prosecuted and judged by the court of public opinion and left to do whatever I may, to clear my name." He added that such experiences leave permanent dents and injuries to one's soul and reputation. "Why am I being taken through this? Why does there appear to be an effort to create a perception in Kenyans that I am a prime suspect?" Mr Kiunjuri asked. Devolution CS Wamalwa said he went to the DCI "to clarify that the dams are not in my docket". Also questioned was Water CS Simon Chelugui who has admitted that Itare dam "is facing contractual challenges, which we are working on." The dam was abandoned by the Italian company CMC di Ravenna. Tourism CS Najib Balala has been questioned by the EACC on the awarding of a Sh100 million contract made during the American Society of Travel Agents Destination Expo in Nairobi in 2017. He has dismissed the investigations as political. "We can fight corruption but the challenge sets in when we politicise the war," he said.